CASE Smart Impact CapitalTM addresses the needs and common pitfalls of impact entrepreneurs seeking to raise investment capital. Through action-oriented online resources, Smart Impact CapitalTM allows entrepreneurs to access the right information at the right time. Learn more and sign up for updates at www.casesmartimpact.com . Are you an accelerator or entrepreneurial support program? Smart Impact CapitalTM can help give your entrepreneurs a leg up as they raise impact capital. 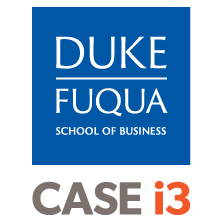 Developed from lessons from our work on the Social Entrepreneurship Accelerator at Duke, our partners like USAID, Spring, MIT, Unreasonable Institute, and SOCAP are using them before, during and after in-person sessions to give programs an effectiveness boost! Are you an Impact Entrepreneur Raising Capital? Smart Impact CapitalTM can help you learn quickly and easily from other expert entrepreneurs and investors about finding the best impact capital for you. A recent cohort of global entrepreneurs who used the modules gave them a Net Promoter Score of 74 (the same as Apple’s which was 74 in 2013). What is Smart Impact Capital? The 9 modules of Smart Impact CapitalTM take you through the process of preparing for and securing investment capital. Each module includes short videos, downloadable resources, and flexible, reusable, and interactive tools. These bite-sized lessons were created in collaboration with hundreds of investors and entrepreneurs. Work through a module in one sitting, skip around different resources, or pop onto the site when you have time. Whatever fits into your busy schedule! 75% reported increased confidence in articulating the key business growth areas that require funding to support. See a full blogpost on our results.